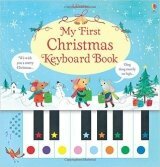 Learn to play simple, well-known Christmas tunes on the sturdy keyboard sound panel attached to the book. Each note is represented by a different colour, which corresponds to the same colour on the keyboard, allowing even very young children to pick out the tunes. Tunes include 'Jingle Bells', 'Silent Night', 'We Three Kings' and 'Deck the Halls'.